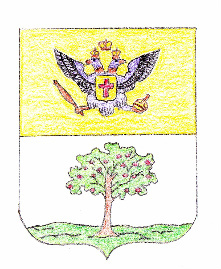 Novolabun' emblem during the Russian Empire period. This emblem was adopted on 22 January 1796. The two-headed eagle is similar to the emblem of the Russian Empire. The lower portion shows a field and an apple tree, representing the verdant and fertile agricultural lands in the area. This area, like much of Eastern Europe has seen many changes in national affiliation and boundaries. Click on the listed links below to view maps appropriate to the time periods described. Labun, town. Zaslav District....about 16 [km] west of Polonnoye, at the confluence of the Poganka and Khomora (nearby communities include Labun, Chrolin, Sudilkov). In 1870, Labun had 496 houses with 1796 occupants - 37% were Jews. Catholic Church, 5 orthodox churches, 3 chapels, synagogue, 2 prayer houses, beer brewery, 3 cement kilns, 6 oil pressing facilities, 3 brickyards, 2 water mills, 26 shops, 51 craftsmen, weekly farmers' market. St. Ann's Catholic Church was built from stone in 1731 by Farther Jozef Lubomierski. Within the parish there were branches from Hryciv and chapels in Kuskowie, Kalenichach, Malych, Mikuline and Onachowcach. At the end of the XVI Century, the land belonged to the Labunski family. Christopher and his wife Anna Chomiakowna built the orthodox Church of the Holy Trinity. The next landowners were Lubomierskis. Despite fortifications, the town was damaged during the Chmielnicicich War. At the end of the XVIII Century - when August III was King of Poland, the town was inherited by Jozef Stempkowski who married the daughter of Duke Martin Lubomierski, famous for holding parties and spending, who built a spectacular palace replacing the ruins of the old and small castle. The palace became famous for balls and parties and Polish King Stanislaw August visited it twice in 1781 and 1787. Details can be found in memoirs of Mr. Ohocki. Stempkowski's fortune was sold to pay bills in 1792. In 8 April 1793, clergy and nobility met here and pledged their allegiance to the Russian Tsar Katherine II. Cohen, Chester G. (2007) Shtetl Finder: Jewish Communities in the 19th and Early 20th Centuries in the Pale of Settlement of Russia and Poland, Heritage Books, Inc.
Southwest of and close to Polna (Polonnoye). 1890 - Meir Lerner, born 1867, was appointed rabbi. Mokotoff, Gary, & Sallyann Amdur with Alexander Sharon (2002) Where Once We Walked, Avotaynu, Inc.
Spector, Shmuel (editor) (2001) The Encyclopedia of Jewish Life Before and During the Holocaust, New York University Press. Labun, Kamenets-Podolski dist., Ukraine. Jews are first mentioned in 1705 . . . Jewish population was 432 in 1765, rising to 1,192 in 1847 and dropping to 952 in 1923 . . .
World War II: By 5 July 1941, the Germans occupied Labun and Polonnoye and other villages and towns in the area. Click the Holocaust link for pages about Labun during this time period.